The first full weekend in April means it’s time again to go fishing in the annual trout tournament in the Gatlinburg and Pigeon Forge area. In 2017, this weekend is April 1-2, Saturday and Sunday, marking the 19th Annual Smoky Mountain Trout Tournament. Once again over 10,000 trout have been stocked in over 20 miles of prime fishing streams for the event. There are cash prizes amounting to more than $10,000, in what is held to be one of the best fishing contests in the southeast. Recent rains mean the streams are deep and flowing. Kids are welcomed into the event with several areas marked out especially for them. And as always, there’s a $500 prize for the SMALLEST trout caught, matching the prize for the largest one! As well as cash there are numerous other prizes, including fishing gear, gift certificates, trophies and discounts for local attractions. Fishing starts a half-hour before sunrise on each day, with weigh-in conducted at Patriot Park in Pigeon Forge by 4 pm on Saturday and 2 pm on Sunday – with winners to be judged by their two-day catch if they fish both days. The tournament as always is organized by local Rocky Top Outfitters. Fishing licenses are required, different ones for locals and visitors, and all local and state regulations must be observed. Only rainbow trout will qualify for the tournament judging. There are separate categories for locals and visitors, to keep things fair, as well as children and adult divisions. The waters fished will extend roughly from the Gatlinburg boundary with Great Smoky Mountains National Park, along the West prong of the Little Pigeon River, all the way to Sevierville. And Roaring Fork is part of the water course. 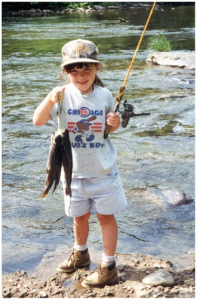 The chosen waters comprise some of the finest fishing with comfortable access, and extends through the three much-loved towns of Gatlinburg, Pigeon Forge and Sevierville. The area is home to many avid fisher-folk, with almost three thousand miles of streams in the national park, of which some 600 miles are home to trout. The rainbow trout featured in the Trout Tournament is actually an immigrant species in the area, and the park has worked diligently to restock its own waters with the native brook trout, which was once dying out and is genetically unique to this area. And fortunately, ranger studies have established that the rainbow trout preferred for recreational fishing has no impact on the native species. So it’s a fishing weekend coming up, and the Trout Tournament accommodates all from the seasoned angler to the very young, and those new to the sport. People who love to fish will tell you it’s one of the best ways to enjoy the scenery and feel of nature – which we have in abundance in this area. It’s a fun weekend in the water, and several hundred people typically enroll each season – there will be another tournament in fall also. Registration is open through 11 pm Friday, and everyone should be fast asleep by then, in preparation for the daybreak start. For more details, check the 2017 Smoky Mountain Trout Tournament website or call (865) 661-FISH (3474). And good fishing to all who take part!